It’s time to catch up with Chris Coyier to see what he’s been doing. It’s been a big couple of weeks for Chris with CSS Tricks and the launch of CodePen.io. Not to mention the success of The Shop Talk Show Podcast. Getting opinions on our industry and how he approaches web design. In this interview we take a look at how Greg Wood works and some of his opinions on design. Check out our interview with Andy Rutledge and find out what makes him tick as a designer. Insightful interview with Jesse Bennett-Chamberlain of 31three.com. Some really great insight from Sam Brown, massiveblue.com. Insight from Trent Walton who has his hands in paravelinc.com, trentwalton.com, TheManyFacesOf.com & design-swap.com. When she’s not obsessing over the perfect typeface for a design, she’ll be crunching on the markup and styles behind the scenes. Designer Interview with Rogie King of Komodo Media. Kyle Weems is the CSS Squirrel and a front End Developer & Humorist for Mindfly Web Design Studio. Interview with Spencer Fry of Carbonmade, answering some questions about his business. This episode we talk about the role of Business Development in your web design/dev company and the culture that you need to have to properly support it and take advantage of it. 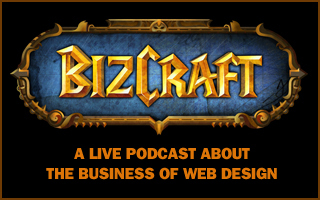 BizCraft Episode 61: “[email protected]#t that matters” – but mostly we talk about Prince. in this, for real; LIVE episode, Carl and Gene talk about “[email protected]#t that matters” – but mostly we talk about Prince. In this Episode of BizCraft we remember why we started doing what we do and talked about some life goals and career goals.